Asoka Sirisena, Senior Deputy General Manager - Technical of Ceylinco Life Insurance Ltd., was re-elected the President for 2018/2019 at the recently held Annual General Meeting of the Sri Lanka Insurance Institute (SLII). Asoka is a product of Maliyadeva College, Kurunegala and counts over 25 years in the Life Insurance sector. He is a Chartered Insurer and a Fellow Member of the Chartered Insurance Institute (CII)–UK. He holds an MBA from Sikkim Manipal University of India. Asoka began his career in the insurance sector with Union Assurance in 1988 and currently works as the head of Technical at Ceylinco Life Insurance Ltd. He has received training locally as well overseas under leading re-insurers. 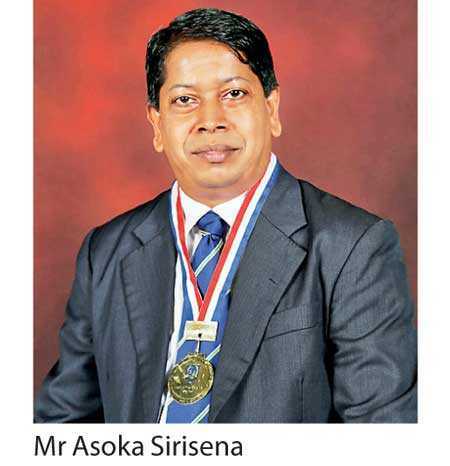 Asoka also served the industry as the Chairperson of the Life Technical Committee of the Insurance Association of Sri Lanka. He has been associated with the institute as a lecturer and has held positions as Vice President, Secretary, Assistant Secretary and Treasurer prior to being elected as President in 2017. The Sri Lanka Insurance Institute (SLII) is the premier insurance educational body in insurance dedicated to the professional development of its members and has been in existence for over 35 years. SLII conducts examinations on behalf of the Chartered Insurance Institute UK, Insurance Institute of India (III) and the qualifying examination for insurance agents on behalf of the Insurance Regulatory Commission of Sri Lanka. The SLII also offers diploma and certificate courses relating to insurance. The new council elected for 2018/2019 comprises Asoka Sirisena – President; Lasitha Wimalaratne - Vice President; Sithumina Jayasundera – Secretary; Mahendra Wilegoda – Assistant Secretary; Hasra Weerawardana – Treasurer and Council Members Sameera Dharmasena, Prasanna Welagedara, Kaumalee Amaradiwakara, Vipul De Silva and Chandima Sumanathunga.